Building a bar, whether it is for the home or office, is a wonderful addition for entertaining guests or just as a super cool hangout with friends. A bar can create the right atmosphere for relaxing, socializing, and adds to the overall appeal of any environment. There are several steps necessary to designing the right bar from deciding on a wine fridge, installing a carbonation system for a kegerator, or to just having a mirrored, well-lit display for those high-end liquors. But one decision that will add the most value to a bar is a stone countertop. Bar tops come in an amazing variety of stones and finishes to just a simple granite top to highly sought-after semi-precious slabs. Choosing the right top usually comes down to two factors: budget and aesthetics. One place to look at a variety of countertops is on the internet. One website that offers an amazing selection of bar tops is StoneMart.com. When it comes to choosing the right stone top for your bar, things to consider before making a purchase are pattern, color, tone and stone type. Each stone type has its own characteristics that set it apart from its brothers. Granite is a natural durable stone that no two slabs look alike. Onyx is has a stunning beauty that because of its translucency can be easily be backlit to make the bar the focal point of any room. Another bar top that offers dependability and low maintenance is quartz. Marble offers a classic look that adds value to a home but must be properly sealed to avoid stains. Slate is very resilient and works well in high-end traffic environments. Slate is typically used in roofing because of its low water absorption rate and comes in other shades besides grey. But for a truly spectacular countertop, one that everyone will be in awe, and a little envious, is a bar top made of semi-precious stone. These tops can be a little pricy but they do make up for their cost in overall aesthetic appeal. 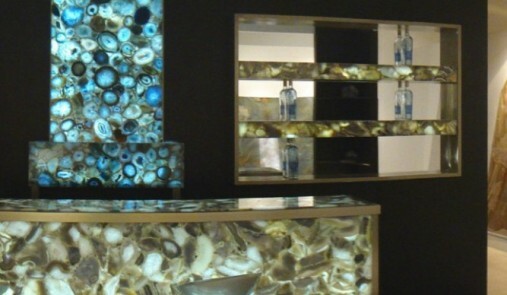 From the creamy colors of mother of pearl to exotic earthiness of red petrified wood, semi-precious slabs should be on the top of the list for any serious bar enthusiasts.